In 1895 Harry Hogarth, James Candy and Naylor Williams filed a claim for the Relief Quartz Mine on a hillside above Six Mile Creek near Angels Camp. 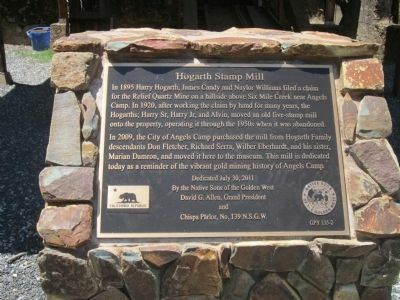 In 1920, after working the claim by hand for many years, the Hogarths; Harry Sr, Harry Jr, and Alvin, moved an old five-stamp mill onto the property, operating it through the 1950s when it was abandoned. In 2009, the city of Angels Camp purchased the mill from Hogarth Family descendants Don Fletcher, Richard Serra, Wilber Eberhardt, and his sister, Marian Damron, and moved it here to the museum. 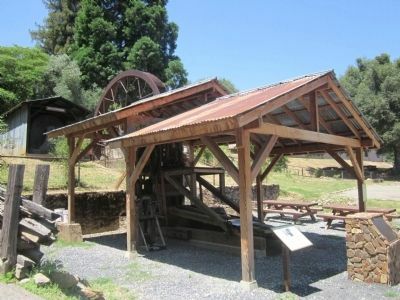 This mill is dedicated today as a reminder of the vibrant gold mining industry of Angels Camp. This marker is the plaque flanked by the two interpretive markers. from South Main Street/Golden Chain Highway (State Highway 49), on the right when traveling north. Touch for map. 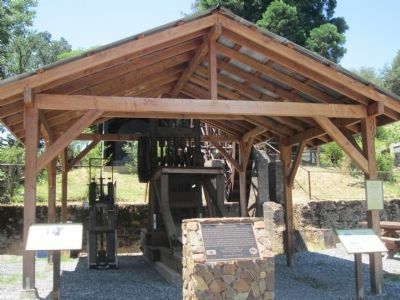 The marker and stamp mill are located on the rear display grounds of the Angels Camp Museum. Marker is at or near this postal address: 584 South Main Street, Angels Camp CA 95222, United States of America. Touch for directions. Other nearby markers. At least 8 other markers are within walking distance of this marker. A different marker also named The Hogarth Stamp Mill (here, next to this marker); The Hogarth Family (here, next to this marker); Water Wheel (here, next to this marker); Whim (a few steps from this marker); The Monitor (a few steps from this marker); Gold Furnace (a few steps from this marker); Just Jenny (about 400 feet away, measured in a direct line); Camp 9 Powerhouse Pelton Wheel (about 500 feet away). Touch for a list and map of all markers in Angels Camp. More. 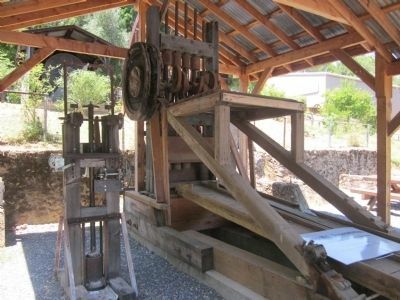 Search the internet for Hogarth Stamp Mill. Credits. This page was last revised on June 16, 2016. This page originally submitted on June 19, 2012, by Syd Whittle of El Dorado Hills, California. This page has been viewed 714 times since then and 2 times this year. Photos: 1, 2, 3, 4. submitted on June 19, 2012, by Syd Whittle of El Dorado Hills, California.